Many may be having the assumption that I may be either an agnostic or an atheist, or maybe a Humanist. I am none of them! I believe in the existence of The Supreme Being called God, no need telling you why I believe there is God; ask me if you care to know, then I will know that you really desire to know. Before I unveil to you what I do each time I missed a Mass on Sunday, let me express my displeasure over the ways/manners some Christians [Nigerians especially] go about with worshiping God. I don’t see why people shouldn’t have common wisdom towards worshiping God. A Mass or Church service is fixed to commence by 7 AM, but someone is coming to Church by 9:30 AM, just to free his or her mind of the guilt of not going to Church on Sunday. So, someone would be buoyantly and comfortably coming to a Mass after the day’s Homily had been delivered: what’s then the essence of the person going to Church? Let me not talk about those who always say and believe that Church is in the heart [“Uka di n’obi” in Igbo Language], and they won’t be attending Church activities. Anyway, I don’t have problems with them so long they are living worthily. So many Humanists are even better than some of us who frequent Church every now and then. If you couldn’t make it to a Church Service/Mass on a particular Sunday, don’t see it that the new week would be riffle with failures; don’t start nursing thoughts that you may experience losses during that particular week –that is a big lie and a foolish thought as well. Yes, if you missed a Mass on Sunday for reasons best known to you; don’t start demoralizing your spirit, please. Don’t starting scaring your mind with thoughts that you have failed woefully that week. Once you know that missing Sunday Masses or Services has not become a habit to you, relax, pick up The Bible, find the texts meant for that day’s Homily or any other good passage in The Bible, read it, preach to your own self, reflect on what you have read; let me tell you: the best preaching is that you truthfully give to your own self; nobody lies to his own mind/conscience, you can only lie against your conscience. If you like, you can step out of your home, go to the next door, and share encouraging words of God; some Christians do share threatening words in the name of disseminating God’s teachings: like the ones some people share on the internet stating that something obnoxious would befall anyone who failed to do what is stated on the post –foolish acts! Having done the above things as, I normally do; also add some charity works/visits either on that same day or any other day that shall be convenient for you, but it will be better if it’s within the same week. You can even choose to help your neighbours in home chores, visit the needy/orphanage; even as a worker, you can decide to offset the feeding bill of your colleague(s). God is full of infinite wisdom and understanding; since He is believed to be a clement God, I wonder why He will not understand and forgive you. Yes, we Christians believe that God created us, and He knows that as humans we are, we are susceptible to weaknesses, sins, and unforeseen acts. He knows that imperfection is running through our blood vessels. Check Out: "STOP THINKING THAT YOUR CALAMITIES ARE GREATER THAN YOUR CAPABILITIES!" SO, DON’T TAKE IT AS A BIGGER DEAL THAT ONCE YOU’VE MISSED A MASS ON A SUNDAY, THEN ALL HOPE WOULD BE LOST; NO, YOU CAN STILL MAKE IT UP. 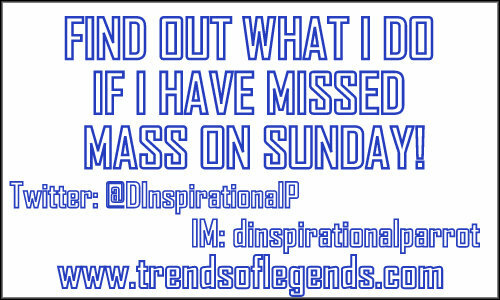 I DON’T FORCE MYSELF TO ATTEND CHURCH WHEN I KNOW THAT MY MIND WON’T BE PAYING ATTENTION DURING THE MASS. GOD GAVE US WISDOM TO USE IT IN WORSHIPING HIM APTLY AND NOT TO BE SUBJECTING OUR MINDS TO CERTAIN STUPID NOTIONS. I ALWAYS PRAY THAT GOD’S WISDOM SHOULD NOT DERAIL ME FROM THE PATH THAT LEADS TO GOD’S KINGDOM; THAT I SHOULD NOT USE MY WISDOM TO DEPRIVE OTHERS THE FREEDOM OF SEEKING GOD’S KINGDOM. I DON’T KNOW ABOUT YOU AND WHAT YOU DO WITH YOUR WISDOM: ARE YOU AMONG THOSE THAT TYPE AMEN TO A POST ON THE INTERNET BECAUSE YOU ARE THREATENED TO DO SO, OR THE KIND WHO SPREAD MESSAGES ATTACHED WITH CURSES IF ONE REFUSES TO BROADCAST? PLEASE GET WISER! GIST: HERE ARE WHAT YOU MISSED BEFORE AND DURING THE WEDDING OF CHIAMAKA ONUMAJURU, PRETTY FEMALE GRADUATE OF UNIZIK!